Atlantic Pump offers the complete line of Sandpiper Pumps in Maine. Known for their air-operated double diaphragm (AODD) pumps. 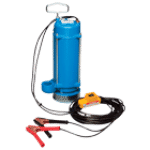 Sandpiper manufactures Standard Duty Pumps, Containment Duty Pumps, Natural Gas Pumps, Specialty Duty Pumps, Heavy Duty Ball Pumps, Heavy Duty Flap Valve pumps, Surge Dampeners, Filter Regulators, and Level Controls. Whether you need local inventory or support for Sandpiper pumps, Atlantic Pump can meet your needs. As a factory-trained distributor stocking Sandpiper products, Atlantic Pump is here to assist. Talk to our engineering staff about reducing your total cost of ownership, and we will help you choose pump types and sizing that will decrease the total costs, factoring in initial investment, labor, repair, and energy costs. In most applications, pumping requirements for flow and head can be met by more than one size of pumps. Choosing the right one ensures ROI – often in weeks. Warren Rupp, Inc., a unit of IDEX Corporation, has been a leading manufacturer of air-operated double diaphragm (AODD) pumps for more than 50 years. The original Warren Rupp pump brand, Sandpiper Pumps, also offers the broadest range of pump models, types and sizes. Sandpiper pumps are used in mining, petrochemical, oil and gas, marine, food processing and various other applications. Sandpiper Signature Series AODD pumps include Containment Duty, Heavy Duty Flap, and Heavy Duty Ball models for the most severe environments. 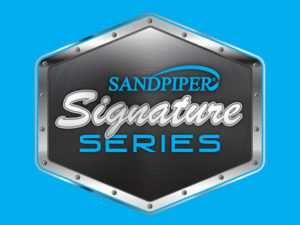 Sandpiper Signature Series pumps are industry leaders in both performance and durability. Request a Signature Series Brochure by completing form on the right. Containment Duty Metallic Pumps and Non-Metallic Pumps are the most leak proof AODD pump available, and they are ideally suited for hazardous chemical and highly corrosive fluid requirements. 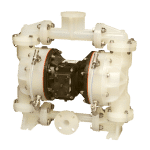 These pumps are constructed of Stainless Steel, Aluminum, Cast Iron, Alloy C, Polypropylene and PVDF with options for TPE (thermal plastic elastomers) and PTFE in diaphragms and check valves. They feature containment chambers to allow leak detection devices – visual, mechanical, and low voltage. These pumps are also designed with hydraulically balanced/coupled pumping diaphragm and driver diaphragm assemblies. Heavy Duty Flap (HDF) Pumps can handle suspended and non-suspended solids, abrasive slurries, and line-size solids. HDF Pumps have excellent suction lift, and come with an extended wear package. All Sandpiper Heavy Duty Flap Pumps are configured with bottom discharge ports, which prevents solids from settling and compromising pump life and give excellent suction lift. 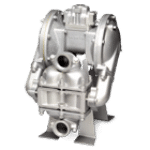 Most HDF pumps are thick wall, and are available in Sand Casted Aluminum, Cast Iron and Stainless Steel construction with diaphragms and check valves made from elastomer and TPE (thermal plastic elastomer). 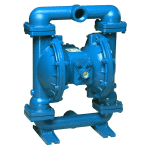 Heavy Duty Ball (HDB) pumps provide excellent suction lift capability and are ideal for thick to highly viscous fluids, or fluids laden with small solids. HDB pumps feature variable porting options and an extended wear package. 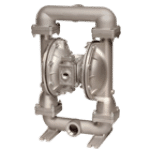 HDB pumps feature thick wall construction and are manufactured from Sand Casted Aluminum, Cast Iron, Stainless Steel or Alloy C with options for elastomer, TPE (thermal plastic elastomers) and PTFE diaphragms and check valves. Standard Duty (SD) Ball Pumps fit applications requiring intermittent/on-demand, portable pumping of suspended solids and moderately abrasive fluids. With a wide range of performance and application capabilities, SD pumps are Sandpiper’s most popular line. Atlantic Pump partners with Sandpiper Pumps for Special Duty solutions. Depending on the application, these solutions may require Built-to-Order Systems, Multi-Pump Systems, custom solutions to achieve UL or FDA compliance, high efficiency dewatering solutions, or submersible dewatering solutions. Applications served by special duty pumping solutions include Oil and Gas, Premium FDA, Standard FDA, High Efficiency, UL Compliant, Submersible Centrifugal, Mining Construction, Wastewater, High Pressure, and Filter Press Systems. Sandpiper Drillers Series Pumps, driven by compressed air, are manufactured for the most rugged drilling applications. G-Series dual power pumps are certified in the double diaphragm pump industry for reliability and safety. Atlantic Pump is recognized as a Warren Rupp Sandpiper factory authorized service center. 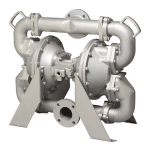 Automotive, Ceramics, Food Processing, Chemical, Pulp and Paper, Coatings, Construction, Marine, Mining, Oil and Gas, Personal Care, Wastewater, and Pharmaceutical are key applications for Warren Rupp Sandpiper pumps.